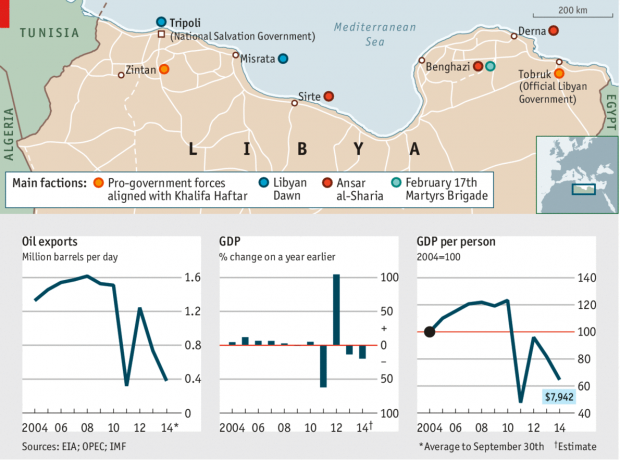 On the third anniversary of the death of Muammar Qaddafi, Libya’s former ruler, the country is violently split. It has two governments and two parliaments. Both the capital, Tripoli, and the second city, Benghazi, are controlled by Islamist militia groups of various stripes. The internationally recognised government has fled to Tobruk, in the east of the country, and is operating from a hotel. Libyan Dawn, a militia now in control of Tripoli, has established a “National Salvation Government”, and is promising aid for families. It has taken a toll on the economy of North Africa’s top oil producer. Growth and oil exports plunged due to instability but bounced back vigorously when the situation improved in 2012. Since then, the economy and oil sales have fallen dramatically. The conflict is becoming a proxy war. Last week Khalifa Haftar, a former general, launched a fresh assault on Benghazi with support from the Libyan government, the United Arab Emirates and, allegedly, Egypt. The official government claims Qatar is aiding the Islamist rebels. Earlier this month the al-Qaeda linked militia, Ansar al-Sharia (which also controls much of Benghazi), declared an Islamic emirate in the eastern city of Derna. All this is a far cry from the stable democracy on the Mediterranean that Western leaders had hoped for in 2011 when their air campaign helped overthrow Qaddafi.